Home › Home and Kitchen › Cocktail Shaker Set - Professional Bartender Kit In A Luxury Bag Martini Bar .. 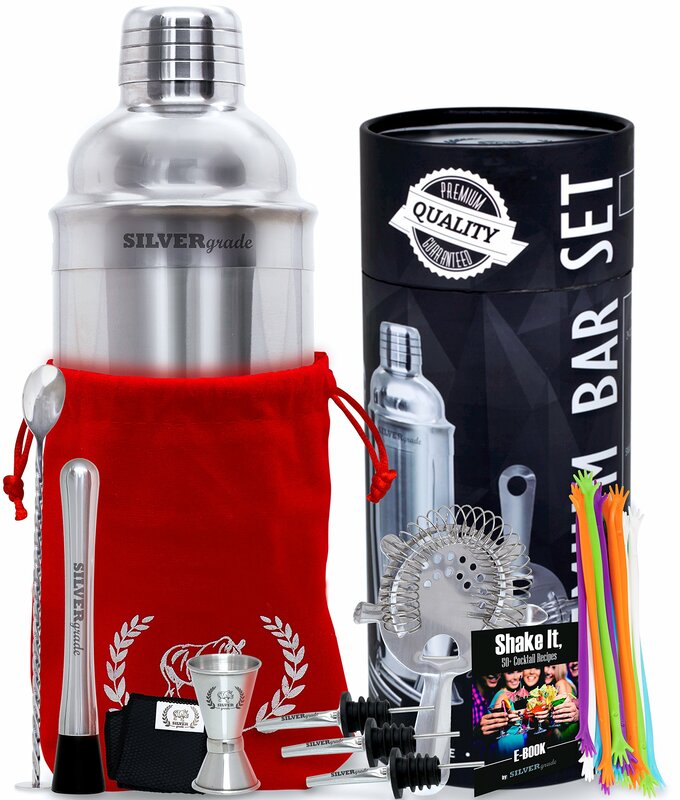 Cocktail Shaker Set - Professional Bartender Kit In A Luxury Bag Martini Bar .. Strength - High Durable Strainer, will last for years to come. Size:Premium Bar Set Making a Delicious Cocktail and want to use fruits andleafs for flavor? Want the Drink to be nice and smooth? SILVERgrade Proud topresent our new Bar Set – Cocktail Shaker, Muddler, Mixing Spoon, CocktailStrainer, Double Jigger, Pourers and 3 Packs of Drinking Stirrers Made ofStainless Steel 18/8 (304), Perfect fit every bar (Stirrers made of plastic).Every Perfect Drink Starts with the Perfect Tools, By SILVERgrade Just 100%Smooth and Tasty Drink Shake Like a Pro Bartender Learn Tricks & Techniques,know the terminology and surprise everyone with your new skills by reading ourComplimentary eBook "Shake IT, Cocktail Style" Still not convinced? We urgeyou to give it a try, Each Purchase is backed with 100% Satisfaction andLifetime Guarantee. Now how's that for an irresistible offer?? So... What areyou waiting for? Go to the Top of the page, Click "Add to Cart" , Proceed toCheckout and you're done!